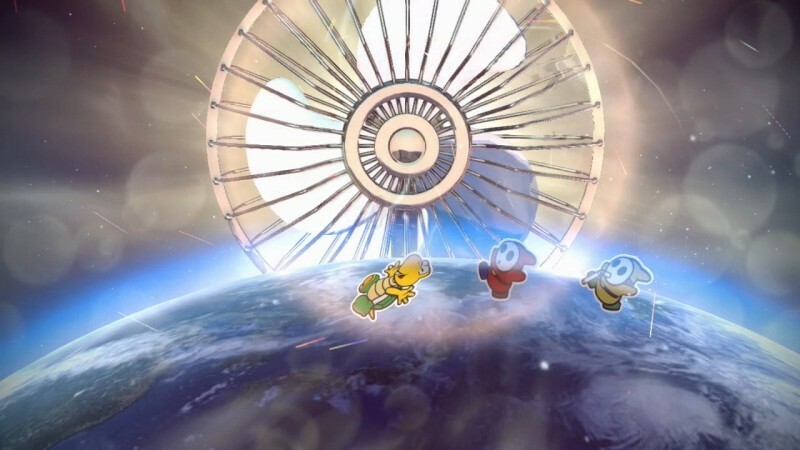 Many think Nintendo’s lovable plumber can do no wrong, but the last few entries in the Paper Mario series have drawn some criticism for their downplay of the series’ RPG elements and a general lack of NPC diversity. We tapped producer Kensuke Tanabe for his take on this criticism and to find out what fans can look forward to in the future. Where did the idea for repainting the world originally come from? We were inspired by Ikuno-san of Intelligent Systems who is the Director of Production for this title. It was about 4 years ago, Ikuno-san saw his kids having fun coloring and since the kids were having so much fun, he thought to himself, “maybe we can do some coloring in the next title.” When I heard his story, I pitched it to the staff since we were looking for a new theme like, “yeah, let’s try incorporating that idea as the theme for Color Splash!” We started experimenting around. It took a lot of trial and error before it felt comfortable coloring with a hammer. The staff at IS (Intelligent systems) persistently worked to make adjustments until it was just right. In the American release, there’s a joke about Mario’s “Lost Levels.” How different are the jokes in the Japanese script? Is there a lot of region-specific humor? For this English translation, we took extra care (even more than usual) to preserve the original text’s nuances especially the keywords that were used as hints. Even then, there were some nuances that we just could not reproduce. In those cases, we had the translators substitute it with regionally appropriate expressions. In the part you were referring to for the Japanese version, Huey just gets surprised because the color disappeared from the Little Paint Star and turned white. There is really no joke here. 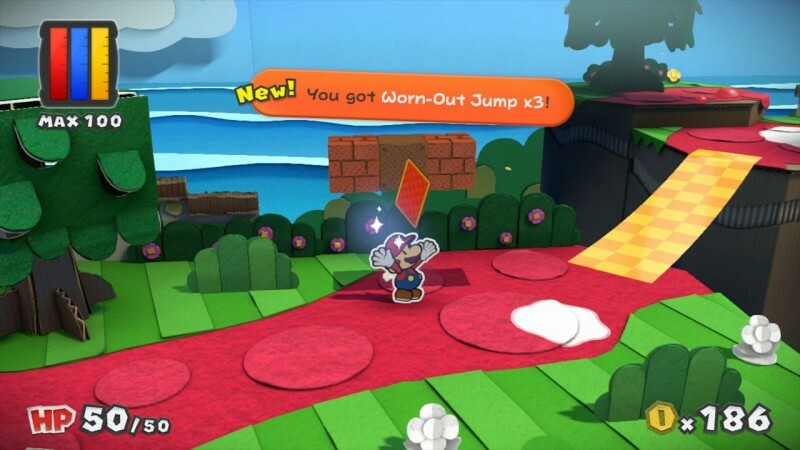 English translators added the joke about Super Mario Lost Levels in English text to make it funnier but Japanese audiences will not understand it as it is tied to English words and phrases. That reminds me. I worked on the localizing the text for Donkey Kong Country 1 and 2 which released on Super Nintendo but it was so full of hard to translate jokes (jokes that would not be understood in Japanese), so I rewrote them into completely different jokes or useful hints by looking at the game graphics. As result most likely the feel that the European/American audiences get from the jokes in the Donkey Kong Country series are very different from what the Japanese version provides. What was the biggest challenge in this game’s gorgeous art direction? This is a story I heard from Visual Producer and the Art team, but they began the project by purchasing and investigating the texture of various types of paper in order to achieve a visual that would convey to the audience that this is all “paper”. They kept in mind that they were trying to depict a world that is rich with various textures by using differently textured paper based on the paper’s usage purpose, such as using different paper for hard environments and soft environments. Especially for the shoreline, they had a hard time determining how many sheets of papers to stack. Too many would make it very thick but too less would make it not look like a shoreline. Apparently it was a series of trial and error. In the end, I think they created a high quality representation of a beach. Why did you guys remove the leveling up system from the series? Color Splash is an action adventure game with puzzle-solving at its core. So, it is true that we did not use the typical RPG system where the player character grows stronger by collecting experience points and upping various parameters of the player character. This is because the concept of levels does not directly relate to puzzle-solving. However, there is actually a leveling system included in this title. We made it so that your maximum paint capacity will gradually increase if you collect a certain amount of the hammer-shaped items that drop when you defeat an enemy. This is a meaningful growth element in this title since painting is involved in both battle and puzzle-solving. It seems like there are a lot of steps to painting a card during combat. For example, why do we have to tap a button when we’re done painting a card, couldn’t we just flick them at the screen when done? What were the discussions like in the office when trying to streamline combat? We prepared other advanced controls and button controls for the combat UI. 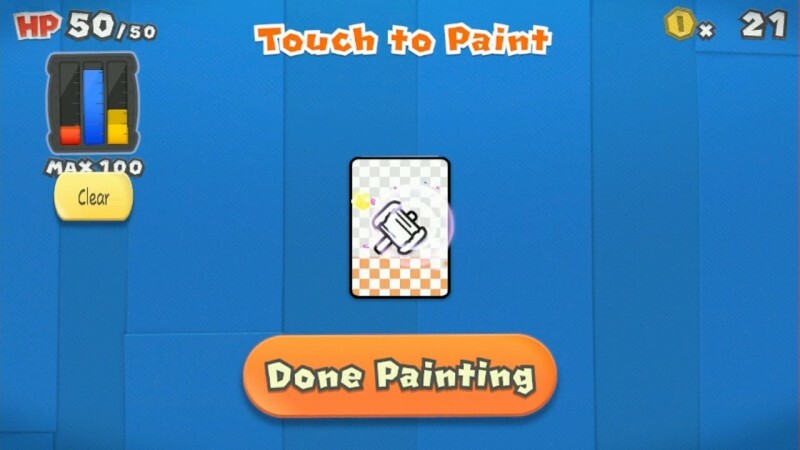 If you use the advanced controls, after you are done painting a card you can flick the card without pressing the button. Actually, at first we were developing a UI very similar to the advanced controls. However, as a result of monitoring the staff themselves, we realized that control mistakes were made frequently playing using the controls without fully understanding the controls. Considering Nintendo’s user base, we need to anticipate that children around the ages of 7-10 will be playing as well, so it is reasonable to think that they might play without being able to thoroughly understand the controls. So we decided to make the UI such that you have to carefully check each individual step to proceed for the basic controls even if that was frustrating. Then, we thought that once users understood the control steps, they could transition to the advanced controls. Incidentally, the goal of this UI was actually unrelated to painting. The core of our discussions in the office was often how to create controls that you can only experience on the Wii U. For example, we wondered whether we could adequately express the feeling when you are playing cards and you glance down at your cards, pick out a card quickly, and flick it into place, or whether the actions themselves would feel cool once users become able to quickly get through these controls. Did you guys ever consider removing combat altogether? Why not just make the game more of a classic adventure game, focused on character interaction alone? We never thought about removing combat altogether. This is because we decided that the element of battling with enemies that block Mario as he proceeds through his puzzle-solving adventure was also necessary. However, we decided to handle combat merely as a hurdle that must be cleared to beat the game, rather than making it the central element of the game. In other words, we didn’t want leveling up to be a requirement for clearing the game. With boss characters in particular, we put the emphasis on solving the puzzle of which cards to use at which times, and so long as you can do that, they can be easily defeated. What do you think of feedback saying that (despite Toads having different personalities) we miss the variety in NPC characters from the old games? Why haven’t some of the old NPCs from the early Paper Mario games ever returned? Mario is not an IP that I created. From the position of someone borrowing the IP, I think it’s only natural to show respect to the person who created it, and let that feeling of respect guide us. So when Miyamoto-san, the father of Mario, asks us “could you make a game with only characters from the Mario family?”, I think it’s only natural for us to give it our best shot. In other words, we are not currently thinking about returning to old NPCs. Incidentally, I do think Color Splash may have proven that we can still make a game entertaining, even if our original characters don’t appear as NPCs. And with that belief, we will keep on continuing to do our best. Would you ever consider bringing back companion characters with different abilities? 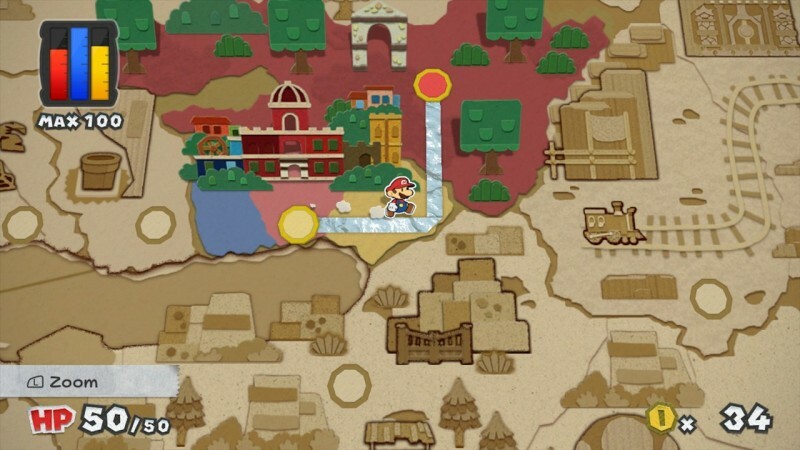 Personally, I don’t give much thought to how we are leaving old methods behind in any series, not just Paper Mario. I always prioritize thinking about how we can build new methods and new elements. Of course, there were some series where we have not made big changes to the systems, but sometimes that’s because we feel as though these systems haven’t been perfected yet, or the gameplay can be expanded even further. We felt both of those things in Color Splash. 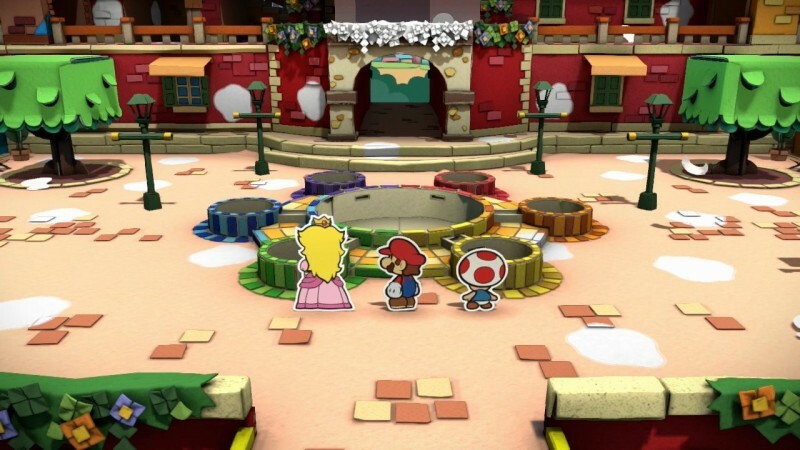 However, I do feel as though we reached the end of where Color Splash is headed, so if we get the chance to continue the series, I think we’ll want to create a Paper Mario with a different system. 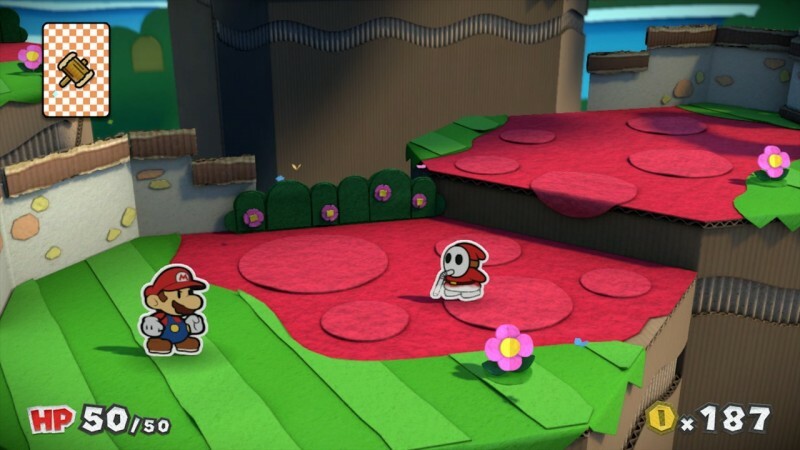 What’s the team’s sense for what fans of the Paper Mario series would like to see in the future? When I joined Nintendo 30 years ago, my direct boss at the time was Miyamoto-san, and he drilled Nintendo’s game philosophy into me. At the heart of that philosophy is this. “When you develop a new game, the game system has to be novel and creative.” I have basically followed that idea while developing games for the last 30 years. So at the same time, this isn’t an expression of self, but rather what will the player find entertaining, or what will they enjoy? We have developed games with an awareness of that viewpoint as well. The result of all of this is that games made in this way will sometimes meet fan’s expectations, and sometimes they won’t. That said, no matter the series or the kind of game, the thing I believe fans want most is for us as developers to put our sincere utmost into doing everything within our power to make an enjoyable game. In that sense, our entire team put their utmost effort into making Color Splash. To everyone, I say that we would be very happy if you enjoy playing it. 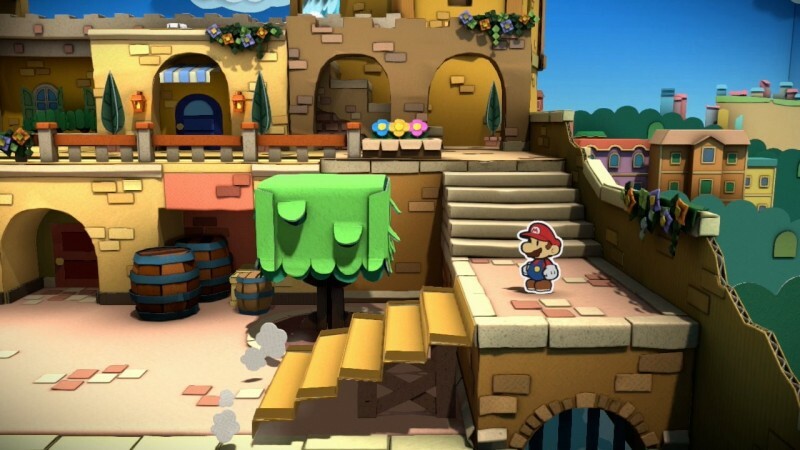 Find out what we thought of Paper Mario: Color Splash by reading our review.